A little girl struggles fiercely through the cold. We follow her throughout the day as she encounters the funny and zany characters of the vibrant city streets. In an attempt to stay warm she strikes a match. The flames blaze to life, illuminating her fantastic Christmas visions. We enter the tumultuous world of her imagination, meeting talking turkeys, dancing rats, Queen Victoria, Prince Albert and their chattering Christmas tree. Having delighted audiences in 2017 The Last Baguette return with this touching, madcap and heart-warming show. 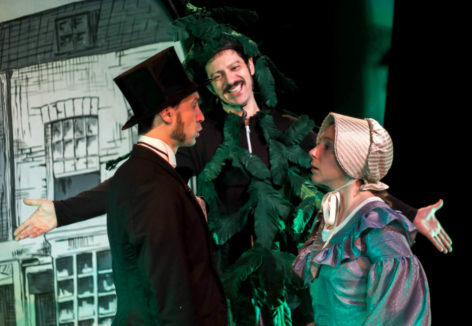 Written by T. A. Woodsmith, winner of the Sunday Times Playwriting Award, the show uses visual storytelling, live music and puppetry to shine a light on Hans Christian Andersen’s classic winter tale. “Such a great show…expert physical comedy and storytelling from The Last Baguette” Gemma Alldred, Programme Manager, Bridport Arts Centre.